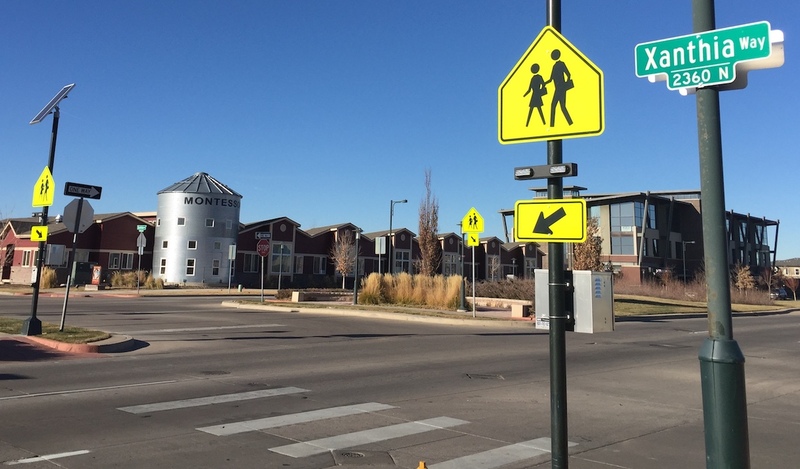 Back in May, Denver Public Works installed a “rapid flashing beacon” at 30th and Downing. The signals are meant to get drivers to yield to people walking and using wheelchairs, and they’re now up and running at five more crosswalks around the city. 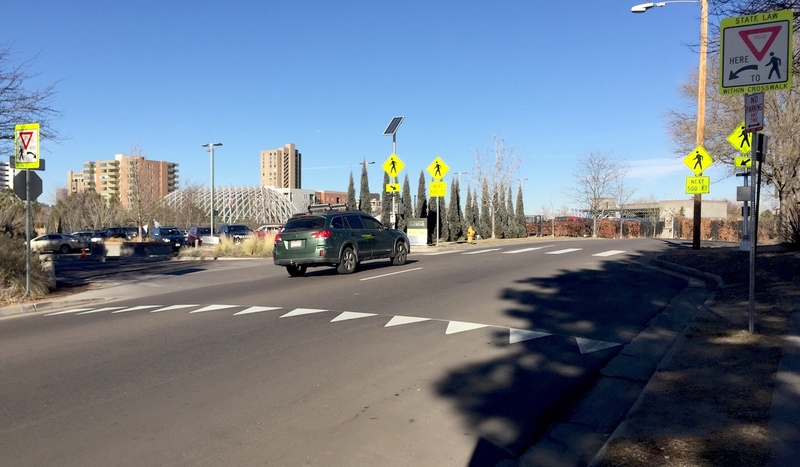 The intersections of Central Park Boulevard and Xanthia Way, 51st and Lowell, Josephine Street at the Denver Botanic Gardens, Holly and Cedar, and 26th and Newton now have flashing pedestrian crossings. To cross using a beacon, you press a button that immediately sets off blinking lights on each side of the street. The lights are fixed bright yellow signs telling drivers to yield to people in the crosswalk. It’s not the kind of thing you tend to see in very walkable cities, where traffic tends not to move at lethal speeds and drivers act more cautiously by habit, because they expect to see pedestrians everywhere. 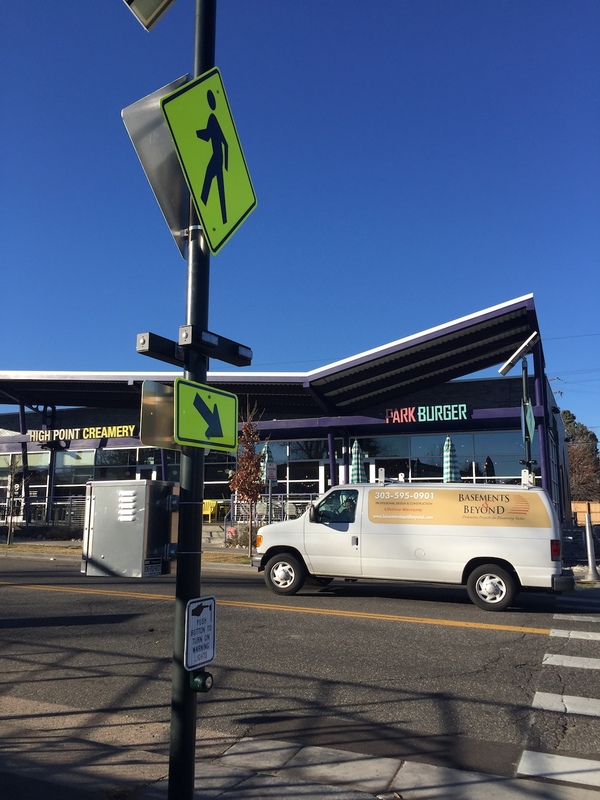 But as an interim measure for high-speed Denver streets that pass through areas with foot traffic, the flashing beacons make sense. Only one of these streets, Josephine, is on the city’s high injury network. There are certainly less affluent neighborhoods that could use these lights as well — areas the city’s Vision Zero plan calls “communities of concern” in its Vision Zero plan. I always wonder how effective these are. Better than nothing, but not the best option. Like maybe some of these locations would be better off with a stop sign, or an pedestrian crossing with an actual red light. I just get the feeling that the blinking light tells people to stop IF they see a person, so their initial thought is to keep going. Like batting in baseball, you’re mentally set to swing unless the pitch is a ball, then you have to hold back. I want to give drivers the ‘take’ sign. In my experience they work better than I thought they would. They recently installed one on Broadway (just south of the Gothic Theater) and drivers (so far) have been really good about stopping right away. They are also going to install one by the Decker branch on Logan, which is BADLY needed as cars never stop even when you stand right under the yield sign. These are extremely effective relative to cost. They have yield rates in the mid 80’s to sometimes low 90’s (percent). They typically cost around $12,000 vs maybe $100k to signalize a crossing. I do worry about the 10-20% that don’t stop. There’s about a dozen of them here in Austin, TX (Although they do look a bit different https://lintvkxan.files.wordpress.com/2016/06/hybrid.jpg). They’re still pretty scary psychologically as a pedestrian, as you have very little trust in a random red light popping up to actually slow cars on what’s otherwise the middle of a long stretch of 45mph road. But, real world experience has been positive, as cars do seem to be obeying them in nearly 100% of the times I’ve been through it on foot or in a car. I forgot they allowed parking along Josephine. If I didn’t use the garage then I’d park west of York like on 11th. Nice photo work btw.